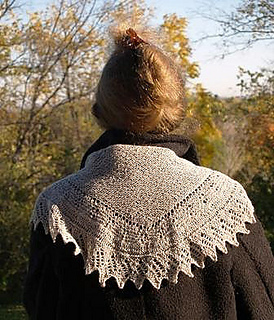 I’ve used the old fashioned term “Fichu” to describe this pattern. 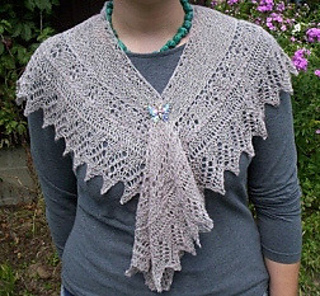 It is not too complicated to work, but some lace/shawl knitting experience would be helpful. This feather weight lace beauty is a triangle “extended” into a horseshoe or boomerang shape to fit smoothly over your shoulders. The center is worked in garter stitch from the lower point upward, shaped with short rows, and bound off at the neckline with a crochet chain. Then stitches for a narrow border with eyelet design are picked up along the outside edges and worked outward. Finally a lace border is knit onto the edging. 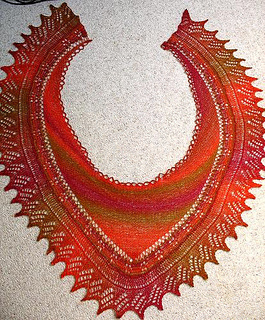 Instructions are provided in line by line format, with a chart included for the edging and explanations of abbreviations and special techniques, as well as photos of the shape while blocking and as worn. 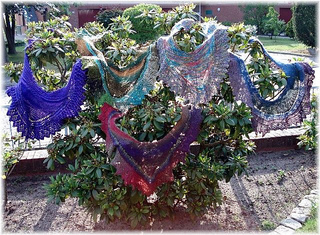 Although originally written for lace weight yarn, many lovely projects have been worked with sock yarn.